Leo Conroy Steminger Part 1 - Brighton technical school, Victoria, Australia. Leo Conroy Steminger B. A. This tribute to Leo Conroy Steminger is very important because it represents the story of many servicemen who missed the ‘fatal bullet’ on an overseas battlefield, but returned to Australia to suffer the painful consequences of their wartime experiences until the day of their death, often many years later. Leo Steminger taught English and Social Studies at Brighton Technical School, Berwick Street, Brighton, from 1935 until 1940. His name appears on the Roll of Honour in the Brighton Technical School “Sea Spray” Magazine,1952, page 2. There is a mistake in the listing in the Roll of Honour – Leo Conroy Steminger served in World War I, not World War II, as stated in the “Sea Spray” Magazine. Leo Conroy Steminger was born on the 25th. November, 1896, near the town of Bairnsdale and, at the time of his enlistment in the Australian Imperial Force (A.I.F. ), on the 7th. August, 1915, was a student at Melbourne University. A copy of the World War I Service Dossier of Leo Steminger, consisting of 181 pages, was purchased from the National Archives of Australia. The Dossier details his wartime injuries, and the agonizing medical problems he experienced during the nineteen years following his discharge from the A.I.F. on the 15th. March,1921. He also endured many frustrations when being assessed by the Repatriation Board for a pension to compensate him for his inability to regain his full health after returning to Australia from the trauma of the Ypres campaign in France. Steminger Leo Conroy. 6409 Gnr. 4th. F.A.B. Date : 7 August, 1915. Age : 18 years 9 mos. Height : 5 ft. 10 ¼ inches. Weight : 11 stone 2 lbs. Chest : 35 ½ inches – 37 inches. Now : (Married 28–5–1924. One child born 7–8–1929). Embarked per H.M.A.T. “Wiltshire” Melbourne. Proceeded to join B.E.F. Alexandria. Admitted 8th. C.C.S – shell wound – wrist and leg (acc.) – France. ​(2nd. occ.). Field. 20 September, 1917. S.W. Left Femur – Field. Transferred to C.C.S. Transferred to A. Train 18. Admitted 8th. Staty. Hosp. (G.S.W. Thigh). Transferred to England from 8th. St. H.
Embarked per H.S. “Pieter” de Coninck” for England. Admitted Pavilion Gen. Hospital, Brighton, England. Transferred to 3rd. Aux. Hospital from Pav. Gen.
Granted leave and report to 3rd. Aux. Hospital. Discharged to Hospital Ship for R.T.A. S.W. Left Thigh. ​ Discharged (M.U.) 3rd. M.D. About middle left femur – drained. C.T. apparently B.I.P. General condition fair. Wide drainage. Compound fracture about middle left thigh ? F.B.? Position appears good. Lateral view only taken. Lower fragment requires lifting a little – otherwise good. A good deal of new bone. X-Ray. Good position in both planes. X-Ray. Upper third – very good position. Much new bone – now required. lying to England on account of pressure on beds. Still some weakness in anterior tibial muscles. ​ Has no extension now. ​ Pavilion General Hospital, Brighton, England. Weakness in left anterior tibial muscles. ​ with bone – not healed. ​ Back splint and foot piece. Foot drop boot. For operation. Under ether, sinus enlarged and many sequestrae removed. Now walks about on crutches. Wounds still unhealed. Red blush on thigh – to stop in bed. 3rd. Aust. Aux. Hospital, Dartford. Disability – S.W. left Femur. Compound fracture of femur united in good position. Foot Drop. Necrosis of bone. Boarded “C2” Furlough. temporarily unfit for home service for more than six months. ​ Surgical appliance – foot drop, boot recommended. 3rd. A.A.H., Dartford. Electrical treatment. popliteal supplied muscles – semi oedema present. Absolute R.D. in external popliteal muscles. Probably partial division of nerve. Cot Hospital Ship, 5 January, 1919. Embarked per “Kanowna” from Southampton. Good union left femur – sinus closing – feels well. ​ Incapacity – unable to say. (Sgd.) A. A. McKay, Capt. Position of bone left leg. ​ Report : good position. Two small pieces metal in inside of thigh, apparently near skin. (Sgd.) J. Sanderson Yule, Major. ​7 March, 1919. No. 11 A.G.H. Disability – S.W. Left Thigh (bone). causing C.F. femur and injuring sciatic nerve. Was on splint nine months. Still has foot drop but able to walk on crutches. ​ Has some stiffness of knee owing to immobilization on splint. Left thigh – discharging sinus. Old C.F. deficiency of external anterior portion of central fragment. sinus level with ? sequestra. Four metal fragments below sinus level. Bismuth would determine if sinus leads to absorption area. ​ only debris being removed. Sequestra seems to be healing fairly well. Is going to break out again on inside. Slight discharge – for further operation. Small discharging sinus on inner side. nothing found. Packed with B.I.P. On work. Has not healed up yet. ​ Leg healed – still requires massage and electricity for foot drop. O.C’s. parade, for transfer to No. 16. Developed erysipelatous rash on thigh. dissected out and then incision closed. but no extra movement obtained. ​ Trace of improvement seen for first time. X-Ray. Left leg, (for condition of bone ? sequestrum). fracture and one above this ? in the bone and two or three lower down! Very slow but definite improvement. Foot coming to life. Feels better. Some pain in leg.? Abscess forming. X-Ray. Knee (Pain in joint – ? rheumatoid). 1/ Right knee apparently normal. (a) thickening of synovial membrane. (b) slight general irregularity of articular bony surface. (? reflex and disuse atrophy). space in mid-line close to skin surface. Has splint – now comfortable. Sensation now all good – still weakness in knee. Disability is due to Military Service. Anticipate total improvement, but very slowly. Sgd.) H. A. Ebmling, Lt. Col. A. A. McKay, Capt. ​ (Sgd.) A. H. Sturdee. ​ Pension claim lodged – Form “Z”. Pension granted at 100% rate from 16 March, 1921.
pus evacuated – drained. Report again. Report daily. File wanted again. Wound has been treated 18 months. Report again 6 April, 1921. I.S.Q. Sinus slit up a little. Sinus closed up about 3 weeks ago. Arts course – Melbourne University. Have lost no time on account of ill-health. ​ lack of control of left knee and foot. G.S.W. left thigh – abscess. Thigh swollen and tender near old wound – foments. around femur region. Wound closed. 4 October, 1921. Doing well. movement knee – lameness. Otherwise well. O.E. Good physique and tone. Thigh - left 18 inches – right 21 ¾ inches. Calf - left 12 inches – right 13 ¾ inches. The condition is the result of war service. C/o G.S.W. left thigh – swelling and weakness. Dropped foot – stiffness knee. Nil improvement during the past six months. Incapacity 75%. Occupation – Teacher. Nil. and the need for constant medical intervention. Partially incapacitated permanently from this date. ​ Lost about four days. Admitted 11 July, 1938. G.S.W. left thigh. Temp. 99.2. Pulse 96. Age 41 years. Made an incision through old scar. Much pus evacuated. This appears to have tracked to outer side of femur (left). Wound curetted and B.I.P.P. drain inserted. No sutures. Very little discharge from wound. Still some discharge from wound. Appears to be granulating up. To get up. Dry dressings. Probe into wound ? bare bone. Desires discharge for urgent family reasons. Consider could be dressed at home and request reasonable. Weight (On discharge). 13 Stone 5 ¾ pounds. (½ s.). ​Pension stablised at 75% rate. both wounds are discharging freely this morning. down to bone – on inner and outer sides of left thigh. yesterday. To report weekly for probing. (Spinal Anaesthesia). H.I. Morph. Gr. 1/3. Atropin gr 1/150. Wound B.I.P.Pd. and S.W.G. sutures inserted. and sinus found leading to a pocket at the back of femur. of left thigh and tube inserted. Wounds B.I.P.Pd. and closed with few S.W.G. sutures. ​ (G.A.) H.I. Morph. Gr. 1/6, Atrop. Gr. 1/150. ​ Rubber dams inserted. Foments. ​ Pension reduced to 75% rate from 26 October, 1939.
suddenly last night. Place not stated. certificate of death could not be given. ​ condition noted which may have caused sudden death. ​Coroner's Notes​ - per I.O. Name – LEO CONROY STEMINGER, aged 44 years. Date of death – 5 December, 1940 (about 11 p.m.). Place of death – 42 Grant Street, Brighton, (usual place of residence). lying on the floor in his pyjamas. Body examined, no marks of violence. Body moved to the City Morgue. ​ (attended the Repatriation Military Hospital). I have to report that about 12.30 a.m. on 6–12–40, from a telephone message received at the Brighton Police Station, I went to 42 Grant Street, Brighton, where I saw the deceased lying on the floor in a sleepout on the back verandah. Deceased was in his pyjamas. Deceased’s wife was present; she stated that her husband had never complained of feeling unwell; she heard him return home about 11 p.m. on 5–12–40 and heard him moving about in the sleepout. She did not go near him, as it was his usual custom to go to his room to rest when he returned home in the evening. He had the day before his death, informed her that he was having a heavy time with examination papers. Deceased was a teacher at the Brighton Technical School – that is why she did not go to the sleepout to disturb him. About 11 p.m. she heard a noise in the sleepout, as if someone had fallen. She went to the verandah and saw deceased lying on the floor in his pyjamas; he could not speak and did not recognize her. She immediately summoned Dr. Giblin, who, on arrival, pronounced life extinct. External appearance. Body of a big man 5 feet 11 inches, dressed in pyjamas, rigor and post mortem staining, no marks of violence, deep old scar on front and back of left thigh, arcus senilis. Heart and Large Vessels: Heart enlarged from hypertrophy and dilatation, dark fluid and clotted blood, marked fibroid degeneration of wall of left ventricle, left coronary artery obstructed by atheroma and clot, right patent. Lungs and Air Passages: Lungs congested, air passages free. Stomach and Intestines: Thick fluid food in stomach, no abnormal odour, intestines normal. Kidneys: Firm, smooth, congested, capsules peeling. Brain: Vessels atheromatous, no gross lesion. On 6–12–40, Mr, Tingate, Coroner, ordered no Inquest. I Effie Lilian Steminger of 42 Grant Street, Brighton, hereby apply to have my war pension increased to the rate payable to the widow of a soldier whose death has resulted from war service. My husband died at Brighton on 5th. December, 1940. Death on 5th. December, 1940 was the result of Atheroma causing Fibroid Myocarditis and Coronary obstruction. Ex-member was in receipt of a pension for a G.S.W. left thigh, which, on account of sepsis required prolonged treatment, prior to discharge, and on several occasions since. There is nothing in the Hospital notes to indicate cardiac affection prior to the fatal event. Atheroma is a constitutional condition which varies in degree in different individuals, and frequency has a hereditary factor. The presence of an arcus senilis at age of 44 indicates a tendency to premature senility. The mention on his A.P. that his father was deceased, apparently during the period of service, is also suggestive, unless the apparently premature decease of the father arose from other than a cardio-vascular cause. In my opinion, death was not the result of War Service or his accepted war service disabilities. ​ Death rejected as not due to War Service. I first met my husband in 1919 and we were married in May,1924. From time of our first meeting my husband has not been in very good health, and as time went on I noticed a general decline in his health, which I consider was brought about mainly by the severe nature of his disability. It was very noticeable that whenever we were out walking, he became easily fatigued and breathless, and as a result of this we found it necessary to purchase a car some eight years ago. He also found that it was impossible to do any manual work such as mowing the lawn or digging the garden. He had to employ a man for this work one day every fortnight. He was very reticent about complaining to his immediate family, but for years showed signs of sleepiness and fatigue. Though I am unaware of his having purchased drugs or medicines of any description, he may have done so. At times he was averse to taking A.P.C’s or Aspro on account of accentuating his heart condition. Dr. Lind has been the family doctor for about twelve years, and although he was not called to the house to see my husband, I had discussed his health with him. He may have noticed something about my husband’s health which may help my case. Practically the whole of our married life, his wounds have been inflamed or discharging. This I consider must have had a serious effect on his heart. He was insured with A.M.P. Society in 1923. Father died on 13–4-24 at the age of 62 years. From the time of his discharge from the Army, he was in the employ of the Education Department. Appeal against rejection of death from Fibroid Myocarditis and Coronary obstruction. My opinion of 16th. December, 1940 was based on the assumption that this ex-soldier probably came from a short-lived family; and a family tendency to death from Atheroma and its sequelae owing to an inherited weakness is recognized in the text books as not uncommon. However, it has been pointed out that the entry on the A.P. of his father’s death is misleading, as this did not occur till some years after the war – namely in 1924 at the age of 62. Considering other factors, Price’s textbook of the Practice of Medicine, states that “it has been said that the most important cause of Atheroma is chronic poisoning.” He also refers to its experimental production in an acute form by the injection of bacterial toxins. In view of the absence of other evidence of causation, the ex-member’s death at age of 44 cannot be entirely dissociated from chronic sepsis in connection with his G.S.W. leg, which has been almost continuous in the last few years. I consider that, on the benefit of the doubt, his death should be accepted as a sequelae of his accepted disabilities. as from 17–1-41, date of lodgment of appeal. Date : 7 – 8 – 1915. Date : 15 – 3 – 1921. Age Real : 18 Years 9 mos. Disability : G.S.W. Left Thigh. Age – Reg : 18 Years 9 mos. Height : 5 ft. 10 ¼ in. Incapacity : 100%. Chest : 35 ½ in. – 37 in. Distinctive Mark. Conj. Cond. : Single. Scar Left Shin. Father : Adam John Steminger. Lindenow, Victoria. Wife : Effie L. Steminger. Number of pages : 181. ​Leo Conroy Steminger was buried in the Cheltenham Memorial Park Cemetery, Wangara Road, Cheltenham, Victoria, on the 7th. December, 1940. Grave Reference : Roman Catholic. Row 134. Grave 15. 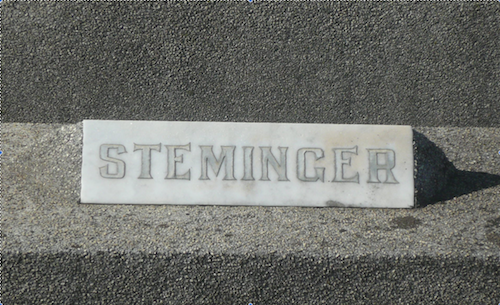 There is no record of Leo Conroy Steminger’s war service on his grave, only the name “STEMINGER”. The grave of LEO CONROY STEMINGER who died on the 5th. December, 1940. Cheltenham Memorial Park Cemetery, Wangara Road, Cheltenham, Victoria. Grave Reference : Roman Catholic. Row 134. Grave 15. STEMINGER. On December 5, at his residence 42 Grant street, North Brighton, Leo Conroy, dearly loved husband of Effie, loving father of Joan, dear brother of Frank (A.I.F. ), and Irene, aged 44 years (late A.I.F.). At rest. STEMINGER. The Friends and Comrades of the late MR. LEO CONROY STEMINGER, (late 10th. Battery, A.I.F. and Brighton Technical School), are respectfully requested to follow his remains to the New Cheltenham Cemetery. The funeral will leave Bathurst and Decker’s Chapel, corner Glenhuntly and Kooyong roads, Caulfield, THIS DAY (Saturday, December 7), at 11.45 a.m.
STEMINGER – The Members of the Returned Soldiers’ Bowling Club are respectfully requested to follow the remains of their dearly esteemed comrade and secretary, Leo, to the place of interment, the New Cheltenham Cemetery. The funeral is appointed to leave the chapel of Messrs. Bathurst and Decker, corner Kooyong and Glenhuntly roads, Caulfield, at 11.45 a.m., THIS DAY and members are requested to assemble at the clubrooms at 11.25 a.m.
“The Argus” Saturday, 7 December, 1940. Page 4. A search of the Internet Database of Australian Newspaper Death Notices - “The Ryerson Index”, revealed that Effie Steminger died on the 25th. February, 1978, age 83 years. 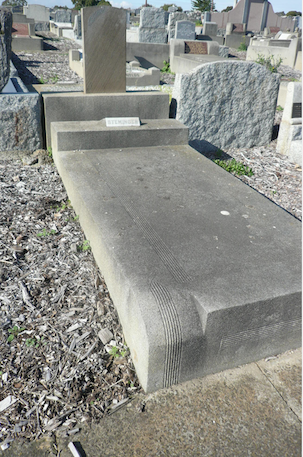 There is a photograph of the plaque dedicated to Effie Steminger on the “Billion Graves” website, The plaque is in the Geelong Eastern Cemetery. The photograph is courtesy of “Nancy” and the details were transcribed by “Mary McCoy”. Thank you Nancy and Mary. The “Billion Graves” website also carries a photograph of the memorial plaque dedicated to Joan Steminger, who died on 18–4–1973, age 43 years. It is located in the Geelong Eastern Cemetery. The photograph is courtesy of “Nancy”, and the details were transcribed by “Gemini1945”. Thank you Nancy and Gemini. The Brighton Technical School Magazine “Seaspray”, 1945, page 18, records a reference to the “Mr. L Steminger Scholarship” donated by Mr. W. Keys.